In my post from last evening, I wrote about the experience of getting out with my camera after over three months without using it. I thought I'd follow it up today with a frame from my last outing before my summer hiatus. A few days after I accepted my position at Harvard in May, I took a celebratory trip out to Parker River National Wildlife Refuge. 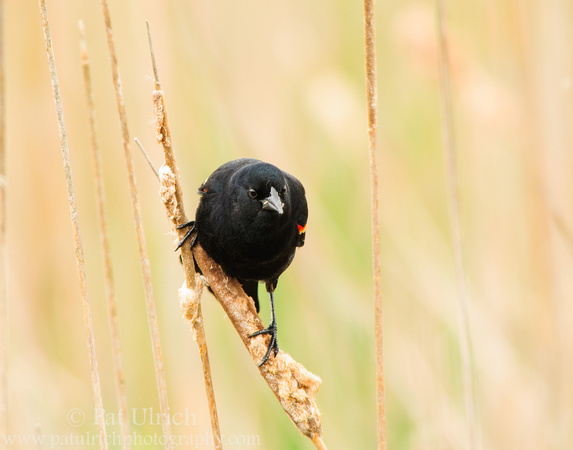 Unfortunately, I didn't see much out there except for this gregarious red-winged blackbird bouncing between cattails along the road. It had been a while since I had touched my camera when I went out on this mid-August trip. Actually, much longer than "a while" -- especially compared to the frequency I became accustomed to in California. It had been over three months since I tried to make a meaningful image. Worse yet, it had been just as long since I was able to be out enjoying and connecting with nature. Throughout my growth as a person and a photographer during the past half-decade, I had really come to rely on these moments of connection with nature to help to re-center myself. So in the end, enough was enough, and I had to prioritize some time to get outside. One weekend evening was all I could take, but it would have to be enough. My wife and I hopped in the car and drove out for the sunset on Plum Island on the North Shore. I was almost giddy with excitement to be going through my pre-trip rituals of charging batteries, formatting memory cards, and cleaning lens surfaces. Donning my outdoor clothes and hiking shoes gave my heart an extra bounce to its step. All of these things were leading to seeing the ocean, feeling the breeze, and smelling the warm salty air. I could feel it in my soul, and couldn't wait to hit the sand. When we arrived at the Parker River National Wildlife Refuge entrance, I was hit with the sad realization that it was summer in the Northeast and not along the California coast. Lot #1 was recently reopened to the public after the plovers had moved on, and it was packed. Signs along the road warned that there was no parking available at Sandy Point, my ultimate destination. I stuck to my plans though, and figured that 90 minutes before sunset, and very near to dinner time, most cars would be heading home. When we reached the end of the island, we were thankful that someone was pulling out of a spot in the overcrowded lot just when we got there. Soon enough I was pulling out my gear from the back seat. What a refreshing moment it was to step out of the car and feel the coastal air. As we made our way along the trail, I could see that the beach was packed. There were excited children and loud families everywhere. Quickly, I realized that I may not be able to find that connection with nature that I so desperately sought. Amidst the chaos of a summer's evening along the shore, I spotted a small group of peeps feeding in the sand exposed by the ebbing tide. "Peeps!" I called to my wife, who knew that she'd be on her own to wander the beach for a little while now that my target was sighted. I watched from a distance as a beachwalker strolled right at them, and thankfully the flock parted and they remained in the area. This was a good sign that these were friendly birds (and most likely naive juveniles), and I made a quicker than usual approach. Soon enough, I was down in the sand seeking an eye-level view. I laid on the shutter and reveled in the rapid fire sound of the birth of new images. 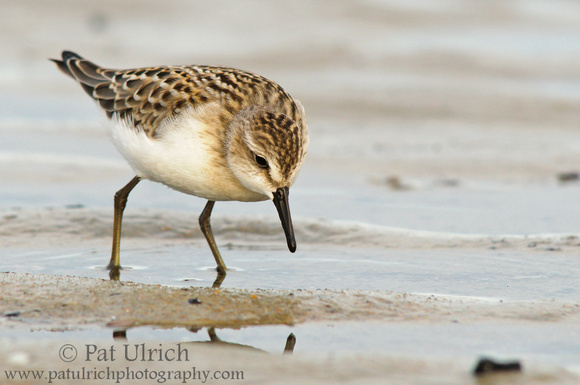 Even though it had been a while since I used my camera, the feeling quickly came back, and I lost myself in the world of these small shorebirds feeding in the sand. After a few minutes, the silence in my mind was disturbed by my own thoughts. How peculiar that I was interrupting myself -- but that's what this particular thought was about. Somewhere in those moments of lying in the sand and framing the birds, the realization came to me that I had actually found the connection I was looking for. It didn't matter that kids were splashing and yelling their shouts of joy around me, because I didn't hear them. It didn't matter that people were looking at this strange guy covered in sand photographing tiny birds that many people don't even notice. What mattered was that I was there, feeling nature -- breathing the air, sensing the pulse of the waves, feeding off the energy of the birds. Every other thought dropped away from my mind, and I was fully in the moment. Focused. It was, ironically, this trip to a crowded summer beach on the Massachusetts coast that helped to solidify my understanding of the personal connection with nature that I have sought out for so many years. There's just something about being in that moment, completely focused and absorbed by the tiny piece of the world visible through my telephoto lens. While I love to experience nature while hiking, I do find a much deeper connection when I have my camera along. For a long time I've wondered why that was. But now I think it all makes sense to me. When my eye is pressed to the viewfinder, it's not just my vision that's reduced to only what is focused within the frame. For those moments, my mind is singularly focused too. There's no thought of unanswered emails, tasks left unfinished, chores yet to be done, and the rest of my everlasting to-do list. Everything else is gone. My entire being is focused on what I can see in the lens, on feeling the energy of the animal I'm watching, and on working to capture just a tiny piece of the magic of that moment in my images. What a truly meaningful experience it is to have a singular focus, even if it only lasts for the fleeting time of a wildlife encounter. It's no wonder I keep coming back for more. I'm already looking forward to the next time I can bring my eye to the viewfinder and find the quiet solitude that it brings to my mind.